As a customer, you want to choose a partner that can guarantee a stable and continuous quality of PET bottles and containers. Thanks to the advanced production lines, PET Power is able to meet virtually all customer requirements. In addition, we regularly invest in the newest injection stretch blowmoulding machines, in automation and in inspection equipment. By applying the LEAN production philosophy and Sigma 6 projects, we continually improve our production processes. The same approach is reflected in the selection, purchasing, inspection and use of feedstocks and additives. Suppliers are regularly reviewed and subject to audits. We carry out strict inspections on incoming goods and during the production process, we make sure that our products comply with agreements made with our customers. As a member of the RPC Group , we have long-term relationships with leading suppliers of PET and other feedstocks. There is always sufficient material of adequate quality to rapidly produce and supply your packaging. 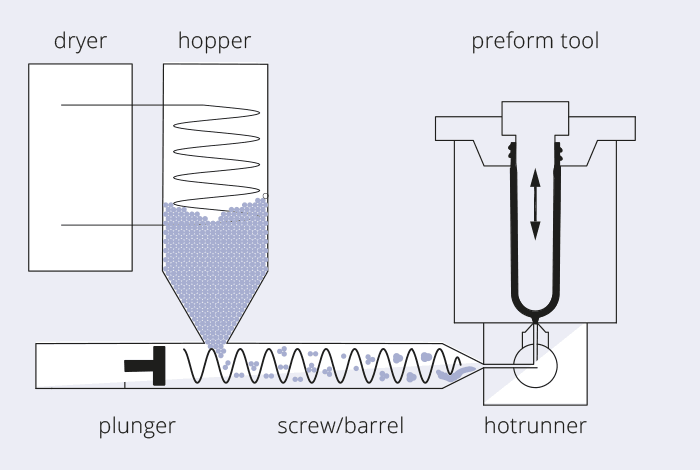 PET Power mainly uses the ISBM production technique (Injection Stretch Blowmoulding). The largest part of production is produced using a single-stage technique. In this technique, a single machine produces both the preform and the final PET bottle or container. This method is highly suitable for both small and larger series. The process is divided into three steps. The PET granulate (feedstock) is dried. 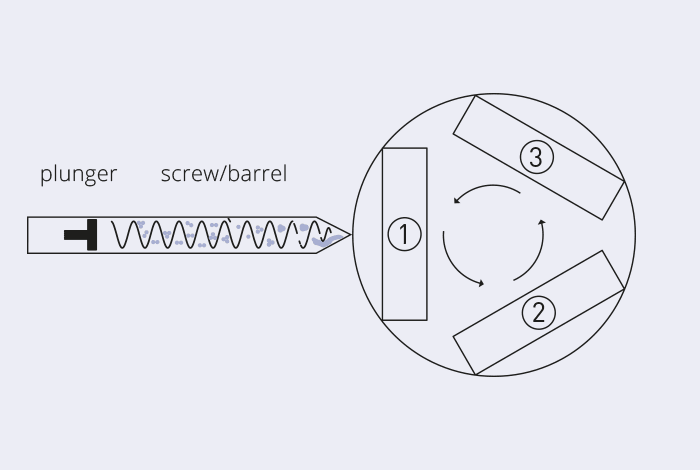 It then goes through a screw-shaped cylinder in the dryer into the machine. During transport, the granulates are heated, which results in liquid PET. In normal PET, the glass-like clarity occurs at this stage. Where required, colouring agents are added to obtain coloured material. The liquid mass is subsequently injected into the first mould: the so-called preform mould. 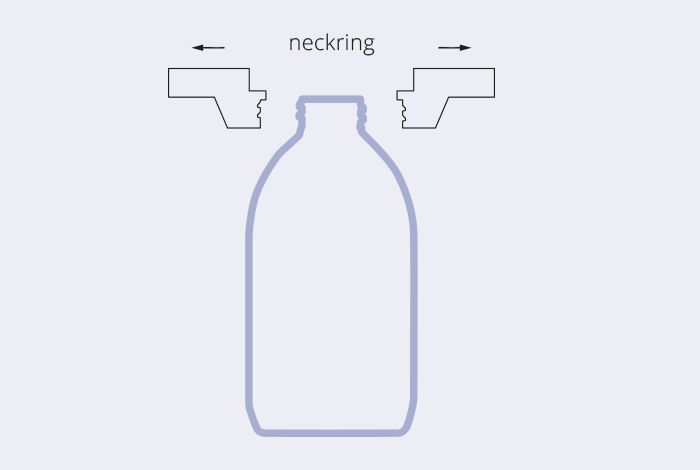 This way, the neck of the bottle or container will get the exact right size and the entire bottle or container will get the right weight, in one go. The preform will now get a high-precision sprayed neck. Subsequently, the preform is placed on a rotary table and moved to the next station. In a number of machines, this is a station for conditioning this preform in order to further optimise the temperature profile, for example. In other machines, this preform is moved directly to the blowing station. The blowmould gives the preform its final shape by blowing and stretching the flexible part below the neck. A rod-like blow pin is inserted to stretch the material towards the bottom. 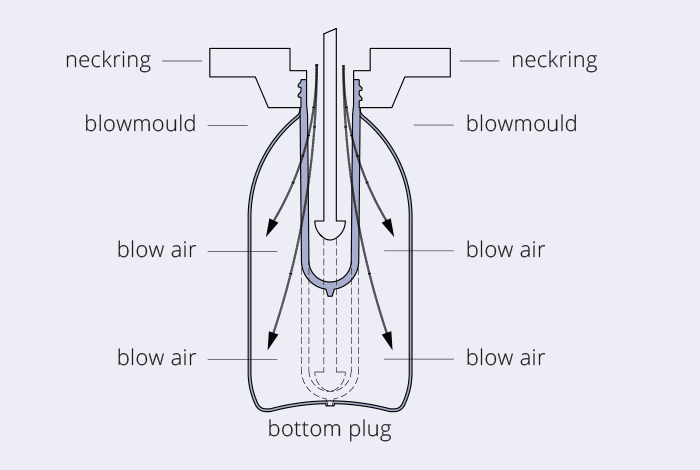 The blowing technique ensures that PET is pressed against the sides of the blowmould, which can result in all sorts of shapes and patterns. In this step, the product is moved to the last station in the machine. A unit places the PET bottle or container on a conveyor belt for the final check for leakage; this is the last step before the packaging phase. Sometimes a visual check is carried out as well, and optionally an additional visual check with a camera. The checks are related to the customer’s specific requirements. After this, the finished products are packed in boxes or on pallets. PET Power affixes the codes for storage and shipment.